Yes, there are eight zillion kinds of Doritos out there, and they often use Taco in their name. 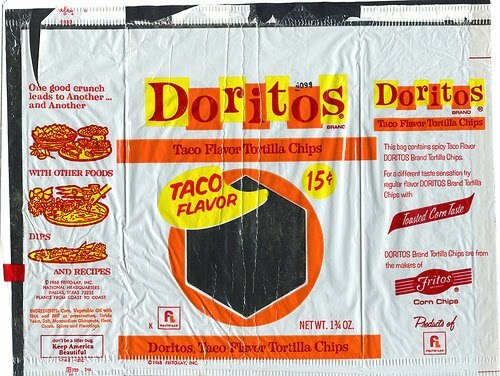 We even hear Frito-Lay will be releasing a limited-edition throwback Taco flavor this month. According to Wikipedia, Doritos came out in 1964, and Taco was their second flavor ever, right after Toasted Corn and EVEN BEFORE NACHO CHEESE. I suspect Doritos HQ actually lost the original recipe -- we were kind of a disorganized country in the 1960s and 1970s -- and just can't admit it, so they keep reissuing flavors with "taco" in the name and acting like they don't know any different. I miss the taco flavor, too. I think that was the first flavored chip I ever had. And, no, tacos and midnight us not the same. I wasn't old enough to stay up that late back then! YES! I still remember original Taco flavor, but young'uns tend to look at you all wonky-eyed if you try to tell them it's not the same anymore. Said young'uns should get off my lawn. No, Tacos at Midnight is definitely not the same. But it IS pretty good, and proof that FL shouldn't give up experimenting just yet. There have been a number of faux taco Doritos over the years (including a Taco Bell taco flavor) and Frito-Lay has never come close to matching the original Taco Flavor Doritos. 15 cents for a vending-sized bag of Doritos? SWEET! Just saw on the back of a Pizza Supreme flavor that Original Taco Doritos are back. Haven't found them yet so not sure what they taste like. Found your blog while looking for an announcement that they were doing this. I just bought a bag near Albany, NY. 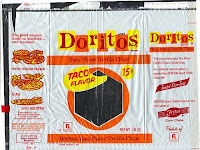 The packaging is a loose recreation of the late-70s bag (but opaque, with a photo replacing the original clear window). They used the current Frito-Lay logo and there's a picture on the back of a bag of Taco chips in the current style, along with "Coming Soon". The chips taste like the "Taco Supreme" variety they made in the late 90s -- the newer, puffier, un-tortilla-like corn chips with a strong Cheeto flavor, the taco seasoning kind of hidden behind it. The ingredient list is, predictably, far longer than the one on the 60s bag you posted. A bit of a letdown with a touch of false advertising, but still better than their other varieties, including "Tacos at Midnight", in my book.